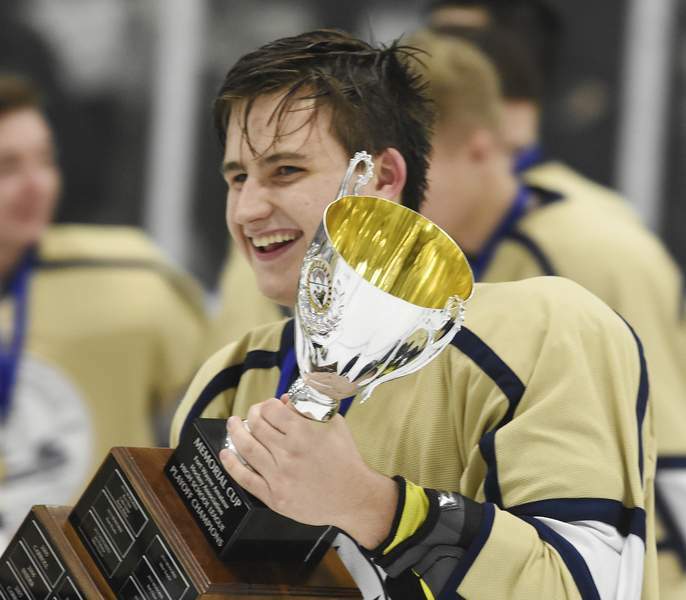 Rachel Von | The Journal Gazette Bishop Dwenger's Griffin Knipscheer is all smiles as he carries the championship trophy after winning the game against Leo on Wednesday. Rachel Von | The Journal Gazette Bishop Dwenger's Michael Zaremba moves the puck across the ice during the game against Leo on Wednesday. Rachel Von | The Journal Gazette Bishop Dwenger's Louie Knipscheer, left, and Leo's Ryan Freeby fight for the puck during the game at SportONE Parkview Icehouse on Wednesday. Rachel Von | The Journal Gazette Bishop Dwenger celebrates with the championship trophy after winning the game against Leo on Wednesday. Rachel Von | The Journal Gazette Bishop Dwenger's lifts up the championship trophy after winning the game against Leo at SportONE Parkview Icehouse on Wednesday. 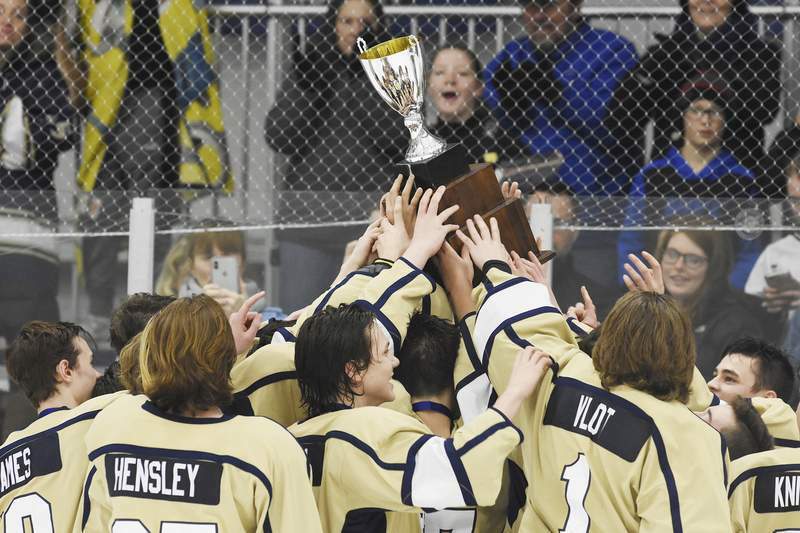 Louie Knipscheer sped down the ice, toe-dragged the puck and then snapped it into the top of the net, cementing Bishop Dwenger’s 4-3 victory over Leo on Wednesday in the Memorial Cup city championship game, and then he set off upon his goal-scoring celebration. He headed toward the dasher boards, pivoted toward the bench, extended his arms as if he were a superhero and leapt into the arms of teammates at the SportONE/Parkview Icehouse. 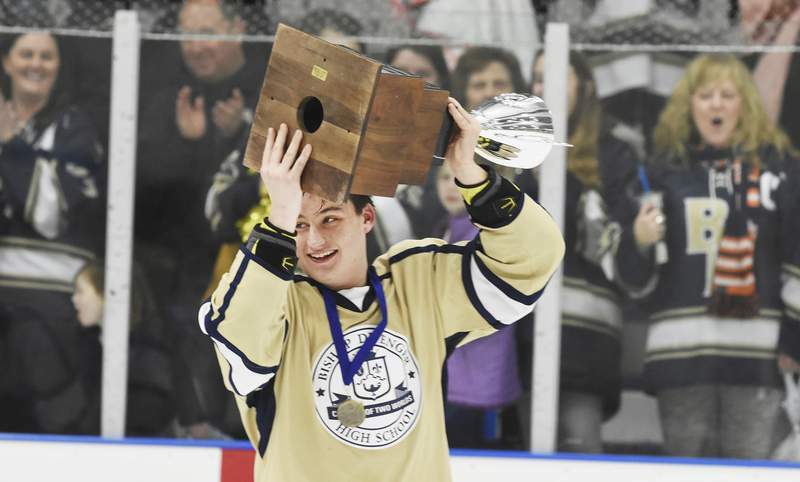 His brother, Griffin, who had scored an equally dazzling goal to put the Saints up 3-2 earlier in the period – he was camped out in front of the net and redirected a shot from the point – didn’t have quite as polished looking a celebration. “Sometimes you’ve got to take a whack at the puck and hope for the best. That was sick,” he said of his Wednesday goal, after which he threw a fist into the air, fell to the ice and rolled before getting up, pumping his fist, almost falling again, and then skating to the bench. During the regular season, Louie had a league-best 19 goals and 27 points in 17 games, while Griffin had five goals and seven points. With three goals between them Wednesday (Louie had two), the Knipscheer brothers lived up to their surname, which is well known in hockey circles around here, especially since their uncle, Fred, a native of Fort Wayne, played 28 games in the NHL for Boston and St. Louis. “It’s a big name to live up to but we just go out and play hockey,” Griffin said. 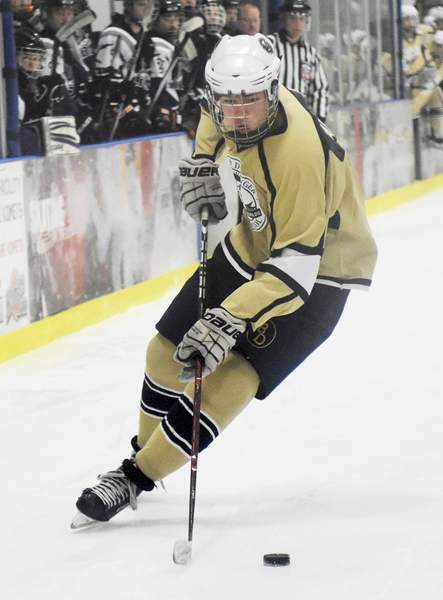 Louie’s winning goal came with 40 seconds left in the third period, after coach Steve Yackley had called a timeout because Leo’s Matthew Clauser had tied it with a rocketing shot from the right boards with 2:56 left – his second goal of the night. They certainly did, thanks to the freshman. “I don’t really know what happened. I just skated down as fast as I could and shot it,” Louie said. 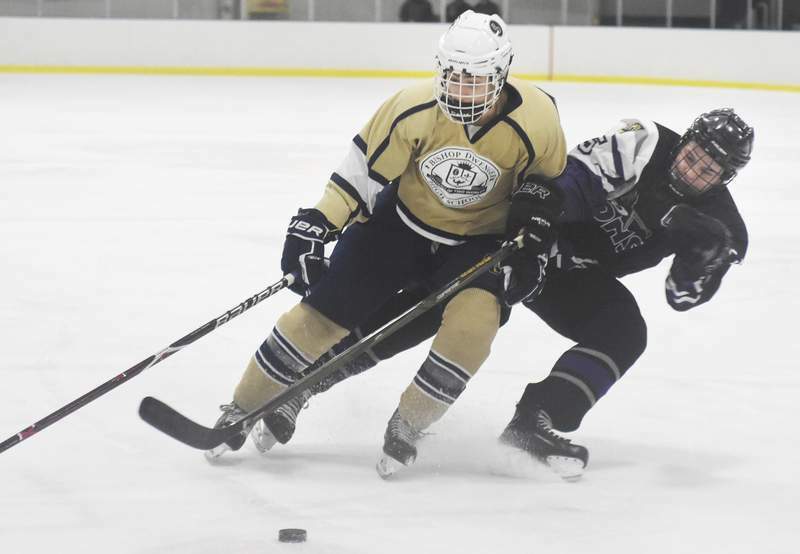 Also scoring in the game were Bishop Dwenger’s Michael Zaremba and Leo’s Lucas Robins, on a night when both goalies, the Lions’ Kyler Bayes and the Saints’ Steven Vlot had numerous stops on shots from point-blank range. Bishop Dwenger entered the tournament as the top seed thanks to a 16-3-1 record. Leo was third with a 14-5-1 record but defeated second-seeded Carroll 5-4 in the semifinals, while the Saints defeated Homestead 3-2 in overtime. Note: Chase Warner, a former Carroll and travel hockey player, was posthumously honored as a Memorial Cup recipient. He died at 21 in a car accident in 2017.